Super Lucky Frog is a popular Video Slot from Net Entertainment, one of the world’s largest and most reputable providers of casino software and games, and unlike some of the software providers more action-packed, fast-paced titles, Super Lucky Frog is designed to be a calmer, more relaxing playing experience. This is made apparent through the theming of the slot (which uses a variety of cute animals to make up the reel symbols), as well as the musical soundtrack, and graphics, all of which are designed to emulate a chilled out, stress-free environment. 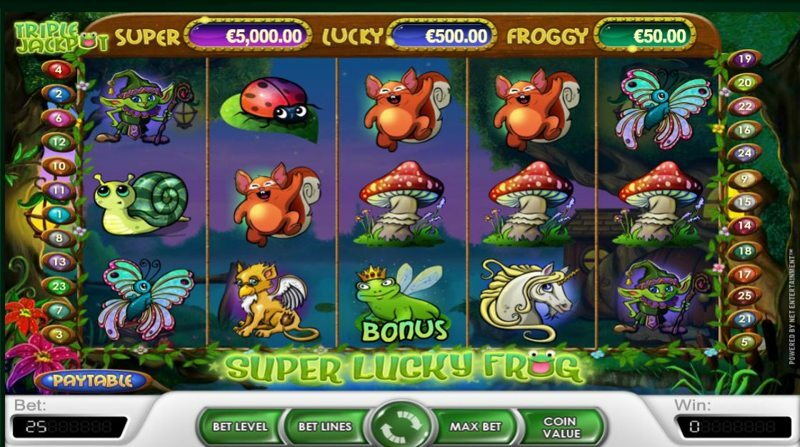 With 5 reels and 25 pay lines, Super Lucky Frog is fairly congruent with many Net Entertainment titles; what really makes it stand out, however, is the state-of-the-art mobile-optimized version of the game, which allows players on phones and tablets to enjoy the game in stunning High-definition. With almost all modern devices supported, an Internet connection and online casino is all you need to get started! Triggered by landing three or more scatter symbols in view, the free-spins round awards anywhere from 10, to 30 free-spins depending on how many scatter symbols you land. During the free-spins, any wins you make are privy to a 3X multiplier, and it’s relatively easy to re-trigger more spins, ensuring you can carry on gaming indefinitely. While there’s no sticky wilds or wild reels, wins tend to be far more common during the bonus, and thanks to the 3X multiplier, you don’t need much to make up a decent sized win. Coin Win – Of course, Net Entertainment had to throw a coin win in! If the wheel lands on this position, you’ll win between 8X and 30X your stake. Jackpot Amounts – The other three areas of the wheel are all part of the Super Lucky Frog progressive jackpot, with the Froggy, Lucky, and Super bonuses making up the three different jackpot totals. Simply land the wheel on one of the jackpot portions of the wheel to win that jackpot – there’s nothing to it. Note: Net Entertainment have stated that the higher you stake, the higher the chances of winning the progressive jackpot, so it’s worth bearing this in mind if you plan on playing with the sole aim of taking down one of the jackpot totals.